i'm back to baking. never mind the batch of meringues i forgot in the oven before i left (shhhhhhh! bleah.) i brought back a favourite cookbook from my la collection, "the breakfast book" by marion cunningham, mainly because chika reminded me of its existence, and after flicking through it again, i realised there were quite a few recipes i was curious about. not necessarily about the taste, but from some quirky aspect or ingredient in them. one of these recipes is a yeast bread recipe simply called dairy bread. it is basically a white bread loaf, only loaded with dairy products, including cottage cheese. the thing that piqued my interest was the addition of a scant 1/4 teaspoonful of ground ginger, which was believed to help the yeast work more effectively. hm. i can't say if it did or not--i suspect the teaspoon of sugar added to the proofing yeast had more efficacy. however, because the bread is so bland (it really tastes like baked milk--depending on your fondness for dairy products, this could be a good or bad thing), i found that tiny bit of ginger lent a peculiar bite to the crust. again, don't know if this is a good or bad thing. otherwise, the crumb was soft but springy and it makes a lovely toast. i did have a little trouble with the directions--it says to add only enough flour to make it manageable, but later it says to knead it until it is smooth and elastic. to make it smooth and elastic, i had to add considerably more flour than it took to make it manageable (a whopping 2 cups more), but even with those two extra cups, the loaves were a little flooby. it was perhaps a mistake to read a novel with a character who laments the loss of her teenage cleavage while i was making these loaves. you only need to look at the final product to see why the only thing that came to mind was "support bra". put the wam water, yeast, ginger and 1 tsp sugar in a large mixing bowl. stir and let the mixture dissolve for 5 minutes. add the milk, cottage cheese, butter, the remaining 2 tbsp sugar, salt and 3 cups flour. beat until smooth. add only enough additional flour to make the dough manageable. turn the dough out onto a floured surface and knead for 2 mminutes. let the dough rest for 10 minutes, resume kneading until smooth and elastic. place the dough in a greased bowl and cover with cling film. let the dough double in bulk, about 1 hour. punch down and divide in half. 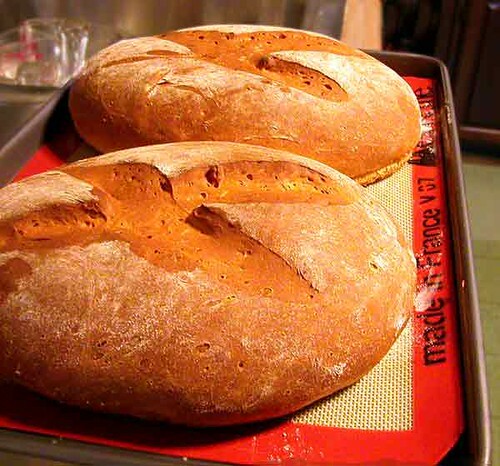 form two round loaves or place in two loaf pans, cover loosely and let rise for 45 minutes to an hour. sprinkle a little flour on top and cut a cross on the top of each loaf. place in an oven preheated to 375˚F, and bake for 40 to 50 minutes, or until the bread is golden on top. Posted by santos. This entry was posted on 20041203 at 9:02 AM You can skip to the end and leave a response. If it tastes like milk, I love it already. Haven't really baked bread in ages...and you make it seem so effortless! Maybe I'll have more courage to bake bread again in the near future. i actually baked this at my folks' house. they have a big kitchen, but every surface is covered in something--i basically only had a square foot to work with, so whenever i make bread there, there's a lot of pounding :-) everything gets pushed up, not out. then i leave the bread to rise in the microwave. sometimes i knead the dough on a board inside the sink. eh. it works. santos! my first time posting a comment, on any blog. i adore marion cunningham's "the breakfast book." her buttermilk pancakes, apple pancake, raised waffles, lemon zephyrs, great coffee cake, and raw apple muffins are staple breakfast items in my house. i too am curious about a number of recipes from her book, but haven't had an opportunity to try them. about the amount of flour you had to use -- i've found amazing variation in amount depending on the type of flour. i usually use king arthur flour, which they say is milled from extremely hard red wheat, with much higher protein and gluten content, thus making a more elastic bread dough. i noticed a totally different feel when i used my generic supermarket unbleached flour -- it's much softer and hence bread dough made with this flour tends to be stickier and quite slack; at the same time, however, pie crust dough made with this softer flour requires less water and comes together better. i've always wanted to try her dairy bread. i have a couple of similar recipes for bread that contains cottage cheese and milk -- one from MFK Fisher's "With Bold Knife and Fork," and one from Deborah Madison's "The Greens Cookbook" -- both recipes also include a good quantity of dried dill and chopped onion. i leave tomorrow for guam; i'll be on island by monday night. see you soon! i took that same flight last week. it's funny because i've been dithering with my king arthur flour order all week--i don't feel like splurging for my xmas goodies this year, but you're right, sometimes the flour really makes a difference. eh. i don't care this year, sad to say. not about the baked goods anyway :-) i used to use the greens cookbook a lot in college, but i haven't really looked at it since then--i'll have to revisit it, and look for that mfk fisher book as well. thanks for the tip! see you soon! I tried my hand at making dairy bread a couple days ago and it turned out pretty good. I did tweak it a bit. Two loaves is a lot in a house where only two people eat bread on a daily basis and everyone else is addicted to rice and I had to use instant yeast because of a few issues I have with the active dry kind. ^_^; Anyway, I featured the tweaked recipe in my blog; please check it out. I just had to acknowledge you. I have to thank you for sharing your expertise with all the rest of us. Your blog's just cool.